Turn Through, oil on paper, 28" x 19"
Genie received her B.F.A from the University of Georgia and her M.A. from the University of Colorado. Genie has shown her work extensively in Iowa and surrounding regions and is included in the collections of Farm Bureau Insurance Company, Pioneer Hi-Bred International and The Iowa Medical Society. Genie Patrick is an independent artist from Iowa City. All of her work is based on landscape - that of Oaxaca, Mexico where she spends her summers or the rural areas around Iowa City where she lives the rest of the year. 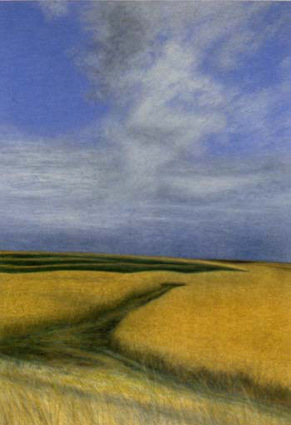 Her oil paintings capture the effects of light and atmosphere on lush, Mexican hills or young corn in the fields of Iowa. The build up of glazed layers of paint render all of her subjects with a soft and simplified tranquillity.